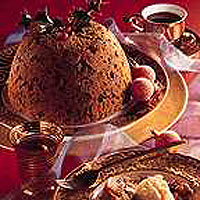 This traditional recipe, flavoured with stem ginger and Calvados makes either one large or six individual puddings, for which you will need 6 x 200ml individual pudding basins. Mix together the dried fruit, ginger, orange and lime juice and zest, and the Calvados in a large bowl. Cover and leave overnight. Beat the butter and sugar together until light and fluffy, mix in the spices, flour and breadcrumbs. Add the beaten egg and milk, then the fruit mixture. Grease a 1.2 litre pudding basin with butter and place a small circle of greaseproof paper in the base. Spoon the mixture into the basin to 1cm below the rim. Cover with a double layer of greased greaseproof paper followed by a large piece of foil. Tie loosely with string so that there is room for the pudding to expand. Place the basin in a steamer or a saucepan. Add boiling water to come two-thirds up the sides of the basin. Cover the pan with a tight-fitting lid and simmer for 4 hours (2 hours for individual puddings). Keep the water bubbling throughout and top up with extra boiling water if necessary. Remove from the pan, leave until cool, then wrap in fresh greaseproof paper and foil. Store for up to 3 months in a cool, dry place or in the refrigerator. Reheat by steaming the pudding for about 2 hours (1 hour for individual puddings).